As far as 2-in-1 products go, Toshiba’s Satellite L30W is too much tablet. Its 13.3in size and its 1.12kg weight make it an awkward tablet to use, and we’ll admit to not wanting to use it as such during our test period — it simply wasn’t alluring in that way. Instead, we used it as a notebook primarily, though even in this guise the product felt bulky. You should only consider this product if you are after a big tablet that comes with a keyboard dock. Toshiba’s Satellite L30W (model PSDM2A-00J002) is designed for those of you who have a need for a big tablet. It’s a 13.3in tablet at its core, but it ships in the shape of a notebook, which means it’s another of those 2-in-1, Windows 8.1-based devices that allows you to pick one form factor or the other straight out of the box. The size and weight of the unit, either as a laptop or as a tablet is a concern, however, and it leaves us wondering if there actually is a need for this type of device. Physically, the design of the Satellite L30W is rather simple: the keyboard dock has a hinge that holds a spine, and the screen slots in and out of this spine in a somewhat cumbersome way — Toshiba claims it can be done with one hand, but it can’t. 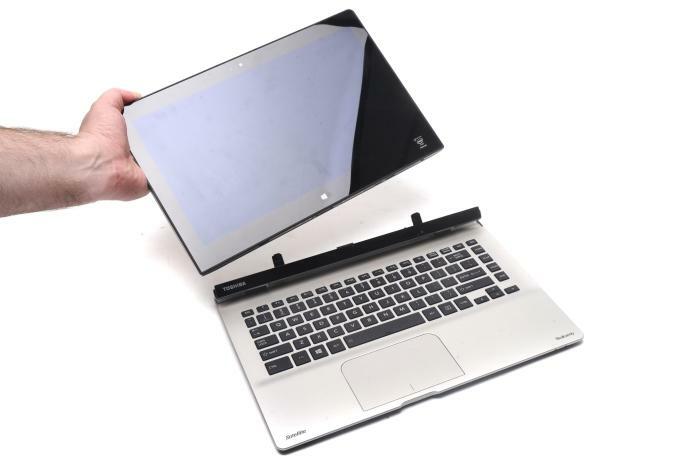 It’s reminiscent of the Lenovo ThinkPad Helix because of this design, but the Helix is a smaller product (11.6in), and it also allows the screen to be inserted facing inwards (towards the keyboard), and outwards (away from the keyboard). With the Satellite, the screen can only be seated inwards. All of the processing power and the majority of the connections are present on the tablet, with the keyboard only providing a power port and a USB 3.0 port at the back. This can make the Satellite awkward to use as a typical laptop if you plan on plugging in USB devices and an external display. It’s the type of product that would benefit from some more ports in its dock. That said, this is a relatively low-cost device (though still overpriced in our opinion) that isn’t aimed at business users, but instead at home and student users. The design bears this out some, but so does the internal configuration. Running the L30W is an Intel Pentium processor of current vintage, and it’s joined by 4GB of DDR3 SDRAM and a 500GB hard drive. For the most part, the unit is responsive. It allowed us to browse the Web, listen to music, view photos, and work in Google Docs without a hitch. For these types of tasks, we can’t fault it. The Pentium CPU has four cores and a frequency of 2.16GHz, but it’s not about speed as much as it is about power efficiency. This was reflected in our Blender 3D rendering test, in which the L30W took 1min 19sec to complete our workload. This puts the Pentium slightly ahead of products that use Intel’s latest version of the Atom (Bay Trail), such as the Lenovo ThinkPad 10, and well in front of products that use the latest Intel Celeron, such as the Dell Inspiron 11 3000 Series. Like some other 2-in-1 products that are aimed at the entry-level market, the storage focus is on capacity rather than speed, and the 500GB drive installed in the L30W will let you hold many movies and music files of your desire. It’s not a quick drive, and this was shown in CrystalDiskMark, which recorded a sequential read rate of 96.7 megabytes per second (MBps), and a slightly faster write rate of 98.3MBps. The 500GB drive in the Dell Inspiron 11 3000 Series recorded a faster read speed. Despite the photo we've taken, it's not possible to remove the tablet from the dock with one hand. One hand has to lift the tablet, while the other has to move the release mechanism on the dock. Battery life was 6hr 18min in our rundown test, in which we disable power management, enable Wi-Fi, maximise screen brightness, and loop a Full HD video file. This is a good time, but since the tablet is 13.3 inches, it does have room for a bigger battery (45 Watt-hour) than smaller products, so we expected a long duration. The keyboard base doesn’t have a battery, but it does allow the power connector to pass through so that you can charge the tablet when it’s docked. Also in the tablet’s favour when it comes to power consumption is the 1366x768-pixel resolution of the screen. We would say the screen resolution is a disappointment, but Toshiba has a habit of letting us down in this area. On the bright side, the lower resolution makes things on the Desktop easier to tap with your fingers. The screen uses IPS (in-plane switching) technology, which gives it excellent viewing angles from any way that you hold it, and the colour reproduction and contrast is enjoyable for looking at photos and videos — but it’s only enjoyable if you don’t have to constantly move the screen to counter reflections from room lights and natural light sources. Connectivity to the Internet is handled by an Intel Dual Band Wireless-AC 3160 adapter, which allows the tablet to connect to 802.11ac routers. During our tests, wireless transfers over this protocol weren’t smashingly fast; they averaged 13MBps. We did experience a problem during these transfers: every time we used the 5GHz, 802.11ac network to transfer files, the mouse pointer could not be moved using the keyboard dock’s touchpad. We could still tap on the screen and drag windows around, but that was slow going. Once the wireless transfer finished, we regained control of the touchpad. It reminded us of the IRQ conflicts we faced back in the mid-90s when a mouse wouldn’t work while a modem was in use. We didn’t experience the same problem when using the 2.4GHz network, which performs much slower in our test environment. The touchpad problem was only present when we transferred large files. We were still able to use the network to stream online video while using the touchpad. We tested online streaming with the NBA League Pass service and the results were rather pleasing. We could stream at the maximum quality of 3000 kilobits per second (Kbps), though with some intermittent dropped frames. At the 1600Kbps setting, the video played back smoother. What we’re getting at with all of this is that the Satellite L30W is a decent computer for the doing the basics, and that it will be useful if you want something to use around the home. However, it’s the size of the tablet that we have issues with. At 13.3 inches, it can be hard to hold conveniently, and its weight of 1.12kg is also heavy compared to other tablets. But even when docked with the keyboard, it can feel awkward to use as a laptop. The weight balloons to 2.1kg when the keyboard dock is attached, which is about 500g heavier than even a typical 14in business Ultrabook, and the design of the unit can make it feel uncomfortable to rest in your lap. The tablet weighs 1.12kg on its own, while the keyboard dock weighs 981g. It’s a top-heavy unit when it’s used as a laptop, and this is due to the tablet housing all of the processing power and connections. Thankfully, it’s designed with a good balance so that it doesn’t tip backwards. That said, the tablet does rock back and forth quite a bit when it’s tapped. The dock also bends noticeably when you tilt the tablet forwards while it’s sitting flat on a table, and ours also made a ticking sound on the left side. When docked, the L30W acts like a laptop, which means that closing the lid will put the tablet to sleep, and then lifting the lid will wake it up again. This wasn’t always the case, though, with the tablet sometimes staying off and forcing us to press the power button at the top-left. Next to the power button is the volume rocker, which controls the output of the Skullcandy branded speakers that Toshiba has installed. These speakers reproduce high frequencies loudly, but they lack any sort of enjoyable low frequency response. The position of the speakers low-down at the rear of the tablet also means that they are too easy to muffle when you hold the tablet in a typical fashion with two hands, or when you let it rest in your lap. Ports on the tablet include mini-HDMI, USB 2.0, audio, and an SD card slot. The bottom of the tablet has the dock connector, some notches for the dock, and the power port for the tiny power brick that's supplied. Use Bluetooth to tap into a wireless speaker system, or plug in some headphones if you want enjoyable all-round sound. That said, our tablet arrived with its Realtek driver’s equaliser setting parked on ‘auditorium’, which left us perplexed at first as to why every song we played had an empty feel and an annoying echo through our headphones. It may have just been the previous reviewer changing that setting, rather than Toshiba shipping it like that from the factory, but we’re mentioning it just in case. Other features of the tablet include a USB 2.0 port, a mini-HDMI port, and a full-sized SD card slot. There is only one camera, which is front-facing, and there is a power port at the bottom for when you want to charge it without placing it in the keyboard dock. The dock’s keys aren’t backlit, and they feel a little spongy, but they are soft enough and responsive enough to be used for long typing sessions at a desk. It costs $899 in Australia, and $1099 in New Zealand.